Leyla and Mike had the most amazing engagement session in New York City, NY. They flew us down for a few days to document some of their favorite places. We did some photos in Time Square, Tiffany's on Fifth Ave, Central Park, and the Waldorf Astoria Hotel. 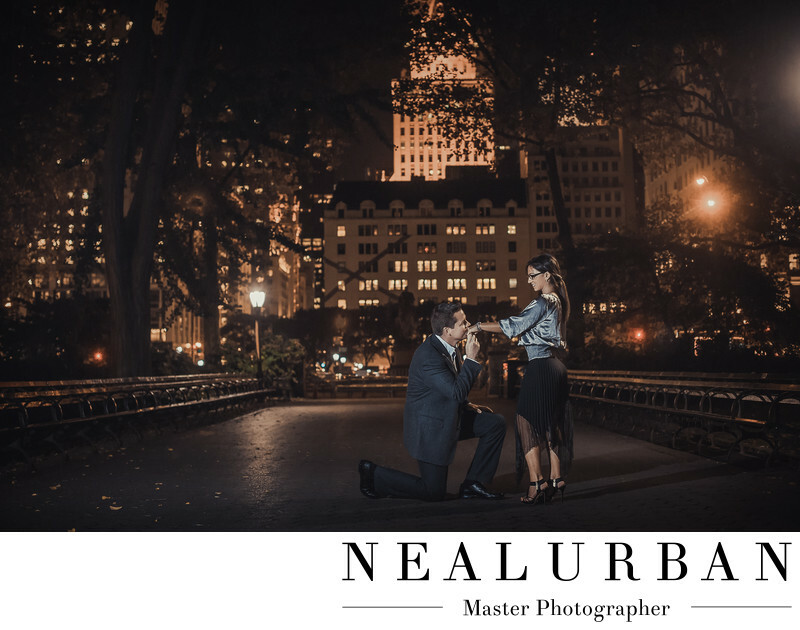 One thing Neal really wanted to do was photos in Central Park at night. We wanted the city lit up in the back ground. We walked around for a little while with Leyla and Mike. We stopped along the way and loved this spot! The city lights looked amazing! Leyla and Mike were super dressed up too! We had Mike take a knee like he was reenacting the proposal. He grabbed Leyla's hand and brought in it for a kiss. It was beautiful! It was so crazy to be in Central Park and hardly anybody in it. We thought we would be dealing with a bunch of people, even at night! We walked around so many different parts of the park that night. It was so pretty lit up at night. The next day, we also went back to the park. The couple wanted to have some photos done where Mike proposed. Unfortunately, it was too far the night before to walk to it. We made sure that was first on the list for the next day! We ended the photo shoot in front of the Flat Iron Building. This was a building Neal really wanted to use for a photo. It was crawling with people and cars. We had to time the photo with passing cars and people walking. It was so much fun. Leyla and Mike had their wedding ceremony and reception at The Mansion on Delaware back in Buffalo! They had a gorgeous Sunday afternoon wedding! Location: Central Park, NY, NY United States.